Gregory S Trachta is a long time resident of Mudgap, New Mexico, where he is known by another name. “That’s not the way it happened at all,” is sometimes asserted. Prior to residing in Mudgap, he frequently visited from California, Missouri, Colorado, New Mexico, Texas, Louisiana, Massachusetts, and so on. He can be seen in the nearby picture, heading confidently into, one supposes, the future. “I’m getting into that game, come Hell or high water.” The campus-wise older brother of a fellow freshman led us toward Aggie Memorial Stadium, September 10, 1960. Student ID’s hadn’t yet been issued, and there was ambiguity about admission onto Quesenberry Field. Exactly how we entered is lost in the vagaries of memory, perhaps through a hole in the fence, more likely by walking through the gate, but enter we did, and saw the New Mexico State Aggies skunk the Pumas from Mexico City, 41 to nada. An international football game, being our first college sports experience, was accepted as normal. Indeed, the entire undefeated Aggie season seemed, to precedent-lacking freshmen, the natural order of things. Perspective came later, memory becoming magic. 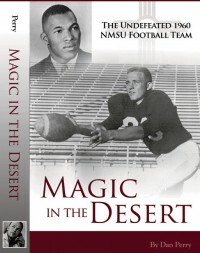 “Magic in the Desert,” by Dan Perry (Magic in the Desert Committee, publisher) recounts the improbable perfect season of the New Mexico State Aggies football team, emphasizing its departure from the long, lusterless Aggie football legacy. In 1960 the suddenly resplendent Aggies carried a four game winning streak from 1959 through an undefeated season of 11 victories, including the last NMSU bowl appearance, now 54 years in arrear, in the Sun Bowl in El Paso, Texas. Before and since that shining moment, the patient Aggies have known mostly football grief. The season of perfection is so extraordinary that Pervis Atkins, one of the team’s stars, has always called it magic. This book gives us the magician and his court. Warren Woodson (1903-1998) coached football for 40 years at 6 different small colleges across the southwest. He probably didn’t invent the wing-T offense, but he perfected it, and combined it with a genius for talent, strategy and game-day tactics that provided him a 177-72-16 won-lost-tied record on coming to NMSU in 1958. He’d had 3 previous undefeated seasons. Talent seemed to blossom wherever he stood, like flowers around compost. The simile is crude but descriptive. Woodson is remembered as so sharply football focused that his personality projected aloof indifference. His success never got him hired at the larger, better-funded programs, perhaps by his own desire, but more likely because he lacked the political will to survive in the big-time bureaucracies of higher learning. Woodson insisted on academic performance. Charley Johnson graduated with a 4.0 GPA in chemical engineering, spent 15 years in the NFL, earning a PhD along the way, and eventually retired from his old alma mater as head of the NMSU Chemical Engineering department. Pervis Atkins had an NFL career and became an actor/producer in movies and TV. J. W. Witt earned a master’s degree and went on to a career in teaching and administration. Woodson didn’t encourage specialization. Several players, among them stars like Pervis Atkins, played offense, defense and special teams. Atkins was famous for touchdowns on kick returns. Atkins, Gaiters and others shared the kicking duties. Even quarterback Charley Johnson sometimes played defense. The team was small by most standards, and diverse assignments were Woodson’s answer to depth requirements. There was always someone to step in. Coach Woodson was popular on campus, as winners always are, but his colleagues sometimes wondered if a mere football game warranted all the fuss. In later years faculty hostility grew as victories decreased. “He has the distinction of getting two schools on probation at the same time,” was heard more than once. Although such criticism was often voiced in “dumb jock” clichés, it had nothing do with sports. During that same period Ralph Crouch, head of the math department, was aggressively building a power-house research team in the specialized field of abelian groups, a then popular mathematical concept. His increasing success was likewise greeted with snide asides from a jealous mediocrity. Football was a low-priority that autumn for a perplexed freshman, intimidated by the academic and social requirements. Nevertheless I followed the team and attended the home games. Bob Gaiters was the national rushing champion. Pervis Atkins had won the title the year before, and seemed always to be the instrument of magic when magic was needed. During a typical desperate play one heard, “He’s trapped, they’ve got him,” prompting the wiser reply, “Don’t bet on it! He can turn on a dime!” Out of a crowd burst Gaiters, or Atkins turning upfield at the near sideline with the authority of an express train. As the crowd noise calmed to a murmur, a young man with his shirttail hanging out rushed into the huddle. “Jackson’s in!” A crimson striped jersey streaked across the backfield to the rhythm of smashing bodies, and darted through the spot where the defensive guard should have been, 10,000 stomping feet affirming expectations met, excitement crackling to seemingly predictable heroics. Charley Johnson was the calm center of the explosive band. His academic prowess inspired whispered legend, a football player who didn’t study and made straight As. My freshman physics class included half-a-dozen team members. I sat amongst them in the small lecture hall, and one of them, I think it might have been Jerry Gambatese, sat beside me, smiling and friendly and surprisingly supportive of a bewildered freshman. Whatever else these young men were, however talented and pressured, they were good people. Coach Woodson’s teams were populated with good people, because he seems to have tolerated nothing else. Mr. Perry’s book gives us the history of Aggie’s football, before and after the undefeated season, along with his personal observations. All the games of the myth-like season are here. All the players are here. The dominant personalities are here. The feeling of the moment is here, a holographic, multi-dimensional freezing of the time and place. Unfortunately, the book was published posthumously, Mr. Perry not quite getting it finished. His career in journalism shows through the expressive prose in a voice reflecting his time, ethics and attitude. His old college roommates, themselves equally qualified in journalism, and demonstrating the Aggie team’s duty-centric norm of friendship and teamwork, finished the book and published it. We thank them for it, and we thank the late Mr. Perry for conceiving it. If you want a glimpse of the better angels of our nature from an unexpected direction, get this book. It represents something longed for but seldom seen. Sudden, unlikely spectacles inspire tidal metaphors, tiny ripples composed of myriad countervailing cycles, coming together in giant waves, even tsunamis if prodded by external influences. It is tempting to think of the 1960 NMSU season that way: the century of Aggie football’s back-and-forth fortunes scrunching up for a brief moment with a violent spasm of excellence. Yes, the 1960 season was a coincidence of numerous individual currents: the crusty career of coach Warren Woodson, the haphazard evolution of racial bigotry, the unlikely availability of heretofore unheralded heroes, and a mixture of political priorities that briefly allowed excellence to dominate, among many others. But these influences don’t add up to the total. The Aggie’s undefeated season was more of a side-slipping intrusion from an alternate universe. It was magic. 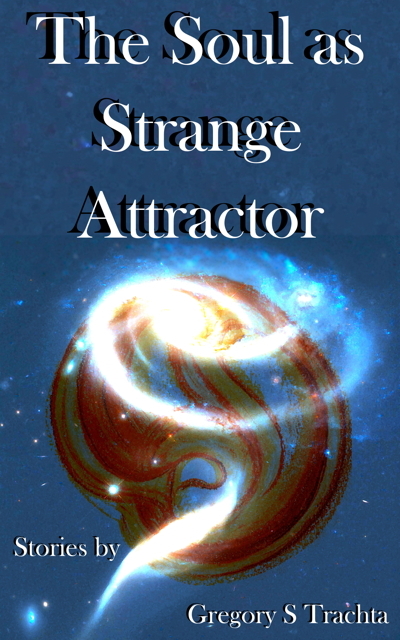 Paperback edition of my collection of stories, The Soul as Strange Attractor, is now available at Amazon. Soon to be at Barnes & Noble and other online retailers. Also found at the CreateSpace site. The stories in “The Soul as Strange Attractor” are literary fiction, but are neither boring, nor bewildering. Until 4/13/15, it is available FREE at Smashwords with coupon code PQ35J. The stories are set in the decades after WW II, with a few echoes from earlier times. All of the characters think their stories are true. Why quibble just because some of them see and hear things? If there is sometimes a lack of seriousness, there is always sincerity. The town of Mudgap, New Mexico is central: some played out gold mines, a few Milagros, but no bean fields. 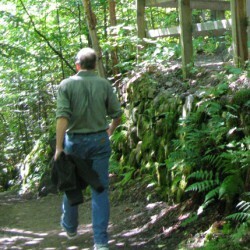 If you never heard of Mudgap, or think it doesn’t exist, look it up (Mudgapnm.com) and link through to the blog (http://thesoulasstrangeattractor.blogspot.com/). Here’s what some of the local Mudgap reviewers have said (There is a lively writers’ colony in Mudgap). The book is available from most ebook retailers and may be sampled at Smashwords (https://www.smashwords.com/books/view/520793).The paperback edition will be available soon from Amazon and CreateSpace.